Bing - Microsoft's answer to Google Search was initially launched by Microsoft in June 2009 and since then Bing has only been a loss affair for Microsoft. Although Bing has been slowly increasing it's market share in web search in the US but somehow, all this success is not converting into monetary profit for Microsoft. 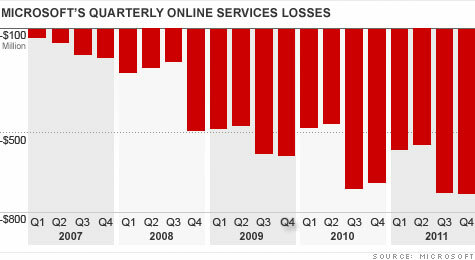 Not only Bing, Microsoft has not made any profits from their web services ever (since 2007). Last week we told you how Bing accounts for almost 29% of the search traffic in the US. This figure may look very good compared to Google's 65% market share but the thing is of that overall 29% of Bing's market share, major traffic is provided by Yahoo! search because of the Microsoft - Yahoo search deal which happened in Feb '2010. Coming to the numbers, Microsoft has lost close to 9 billion dollars on its web service businesses since 2007 after the company started making their Internet revenues public. Of those loss figures, Bing alone has accounted for losses amounting to over $5.5 Billion since it was launched in June 2009 - that's close to losing $1 billion every quarter. Microsoft has been trying really hard to get more and more users to Bing search but the biggest challenge the company still faces is changing the consumer mentality as users have gotten used to searching on Google. The company has also targeted Apple users by showing related iPhone / iPad Apps within search results from Bing on iOS devices. Apart from this, Microsoft has created partnerships with Facebook and has deeply integrated Bing into Windows 8. Now, only time will tell where all these will take Bing and will Bing eventually oust Google as the search market leader. When Bing was initially launched way back 2009, I started using it almost instantly because of it's refreshing looks and the daily changing background image which was something I definitely liked a lot. However, after a couple of months I started losing interest in the search engine and went back to Google search. This happened probably because of the relatively clutter-free interface which Google was providing me with, then. But after that Bing also launched some good features such as homepage previews, search results page previews, flight searches, cashbacks which again caught some of my attention but again only for sometime. Recently after Google started rolling out their Panda update which aimed at removing spam from search results, I was again evaluating the search results for same queries on Bing and Google and to my surprise, Bing was actually performing better than Google!